[Solubility] hardly soluble in water,but soluble in paraffins,mineral oils and ordinary organic solvents. 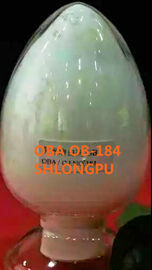 OB can be used for whitening thermoplastic plastics,PVC, PS, PE, PP, ABS,Acetate fier, paint,coating , printing ink ,etc..It can be added at any stage in prodess for process for shitening the polymers and can give the finished products a bright bluish white glaze. The dosage shoule be 0.01-0.05% on weight of plastic.Put whitening agent OB into plastic pellets,mix the mixture thoroughly and then carry out shaping.Fluorescent whitening agent OB is similar to Uvitex OB made in foreign country. Paper drum lined with plastics bags,net in 25kg or 10kg . OB can be handled in accordance with the usual rules for industral chemicals.Avoid dust formation and ignition sources. Stored indry and cool place.